I don’t hunt and — at the risk of losing my “Real American” bona fides — I also don’t own a firearm. In fact, I have never pulled the trigger on anything more powerful than a pellet gun. I can’t drive a stick, either, but that’s a different article. I love animals and have no interest in killing them, but I am definitely not opposed to hunting, per se. I agree that a distinction can be drawn between hunting animal populations that pose a threat when their numbers get too great, on the one hand, and hunting rare or exotic animals purely for sport on the other. Even with no sympathies at all for trophy hunting, though, I found myself rushing to the defense of Cecil the Lion’s “murderer,” Dr. Walter Palmer, a Minnesota dentist. Not because I agree with what he did. Quite the opposite. But because I disagree with what has happened to him as a result of the story going viral. The short version is that Palmer enjoys big-game trophy hunting and paid more than $50,000 for what he believed to be a legal and properly-permitted expedition in Africa. As it turned out, there is significant doubt about whether Palmer and his guides acted legally, having allegedly lured Cecil off of a protected preserve in order to hunt him. The bone of contention for critics actually isn’t the legality, but the death of a beautiful animal at the hands of an evil hunter. I saw comment after comment on all forms of social media calling for karmic justice to befall Palmer, with many going as far as to encourage others to do whatever they could to shut his business down. The Yelp! page for his dental practice was flooded by terrible reviews based on his killing of this lion. Multiple articles from the heroes at Gawker Media and a few other sites openly cheered the pitchfork-and-torch routine. Reports now indicate that his business is on hold (and the future of his practice is in doubt) and that Palmer has gone into hiding. Several of the folks I saw commenting yesterday openly rooted for Palmer’s death, while one person — who is actually a friend of mine — literally said that Palmer should be raped for killing this animal. Naturally, I told my friend that this was not only insane, but also that anyone who thinks someone should lose his business or his life for trophy hunting is more barbaric than trophy hunters are. Although my friend and I thankfully remain so, most of the people with whom I tried to engage — civilly and thoughtfully — were content to name-call and block when confronted with even a hint of an idea that didn’t mesh with their own view on the topic. The question of whether trophy hunting should be legal is separate from what I’m discussing here. Again, I think being anti-trophy-hunting is an entirely reasonable position. The point where I jump off that train is when the anti-hunting folks think that someone who engages in this activity should not be able to make a living anymore, to say nothing of those who think he should be physically harmed. In fact, PETA went so far as to call for Palmer to be hanged. This is not hyperbole. They actually believe he should die. This is a particularly astounding sentiment coming from PETA. If we had conducted a poll of PETA employees as recently as 48 hours ago, what percentage would have been opposed to the death penalty? Eighty percent? Ninety? It’s remarkable how readily we abandon our principles when given the opportunity for retribution. So it goes with the mob. In our fits of vengeance, we are far too quick to destroy people we’ve never met because they offend our sensibilities. Here, Palmer did something that many people find objectionable, but we’ve certainly seen similar actions taken against other folks who have done far less. The goal for most isn’t really “justice” in a traditional sense. Rather, despite their high-minded moralizing, they actually seek the primitive euphoria that comes with power intertwined with feelings of superiority. No regard is given to the life that may have been destroyed by these actions. And why should there be, after all? What is the life of this man compared to the life of a beautiful animal? Never mind that few even knew this animal existed before today. And never mind as well that many, many people get far more agitated over the morally questionable death of a single lion than they do over — I don’t know, let me pull one example at random — the morally questionable collection and sale of fetal body parts. We’re sliding toward some new conception of justice, and this is not progress. The fact that the people involved in this incident are being brought to justice, and Palmer himself is cooperating with authorities (and has expressed regret over the death of Cecil), doesn’t satiate the mob. They must threaten life and livelihood. I fear that our old notions of things like due process are being slowly replaced by something like a battle between righteous online harassment campaigns and defiant GoFundMe accounts. We seem all-too-comfortable with mobs deciding who is allowed to continue to make a living (or just live, period). This is not a new human emotion, but it’s one of the many negative traits that online dynamics amplify and highlight, much to our collective detriment. Thus, for the millionth time during the era of social media, the edges of what we might call “humanity” look just a bit more frayed, and I am left to stick up for someone with whom I don’t want to side. Why? Because, even if I’m opposed to trophy hunting, I’m much more strongly opposed to social-media mobs getting to decide who has the right to exist without fear of losing his job . . . or more. A version of this piece also appeared contemporaneously on Ricochet. This entry was posted in Commentary, General Culture and News and tagged Animals, Cecil the Lion, Commentary, General Culture and News, Hunting, Justice, Mobs, PETA, Social Media, Wildlife. Bookmark the permalink. All things perceived as red-neck are under assault right now. Hunting is definitely in that class. Of course he shouldn’t be killed or physically harmed in any way, I find it radical and bizarre that people would even think that. Now for him loosing his business, I have a completely different view than you. If he did something illegal (and it looks that way but we may never know), he should go to jail. If he gets away with the ( alleged) crime then that seems really wrong. So if he does loose his business over this in place of going to prison I don’t have a problem with that. This is a well thought out nuanced piece about the death of Cecil the lion, it’s a piece that would do justice to Cecil’s life. Big game hunting is cruel and dehumanizing (to the human and animals alike) but the internet lynch mob calling for the ‘hanging’ or some other horrible death for Dr. Walter Palmer and the total destruction of his livelihood is beyond the pale and is not putting the death of Cecil, a lion in perspective. His death is horrible and as a animal lover and specifically a big cat lover myself, his death is nothing short of tragic to me. But let’s keep in mind of all the other ‘tragedies’ that are ongoing in this world. There may be refugees drowning in the Mediterranean Sea right now, Syrian refugees who managed to make it out alive are facing lives in refugee camps, in countries that don’t want them living from hand to mouth everyday. Women and children are at risk of being exploited for their labor and bodies. Iraq is imploding and exploding at the same time creating a second wave of refugee crisis. There are genocides of minorities being carried out in Syria and Iraq, and these are people, human lives. So, a little perspective everyone. Let’s pay our respects to Cecil and all other big game that are legally and illegally poached and hunted every year in a more appropriate and proportionate manner. Thank you for writing this. This is proper perspective. 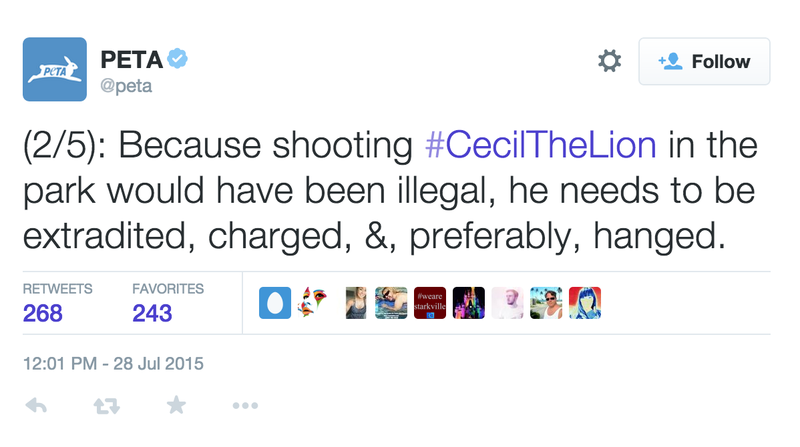 Cecil the lion’s death was sad and unnecessary but the internet mob ‘justice’ isn’t right either. I agree entirely. Thank you.